Denray's Pushbutton Cleaning line comes in various dimensions to accommodate any job size. These tables all come with 80/20 cartridge filters which clean with a 99.95% capture rate at 0.5 micron. The Denray 7200B Downdraft Table contains 2 cartridge filters that clean, which requires a button to be pushed 3-5 times a day, thereby releasing a large amount of compressed air into the filters. The air pulses off the dust, which drops into drawers below the filters. The drawers should be cleaned a few times a month, or as needed. 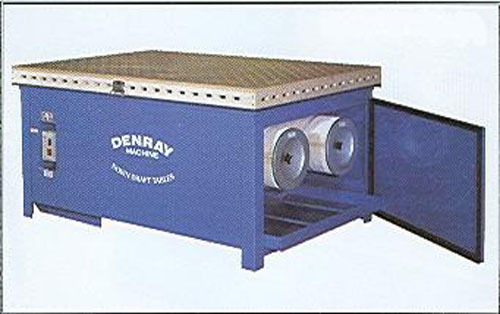 These Denray tables are designed to set end to end, allowing the filters and drawers to be serviced from the front of the machine. The top, as with all other models, has a sprayed on rubber type finish. All models are available with the following options: Explosion Proof Motors (in 3 phase only), Light Bars, Casters, Auto-timers, Mufflers, Chimneys, Carbon Filter Banks and HEPA Filter Banks.